There are approximately 400 species of Aloe. They vary in color from grey to bright green and are sometimes striped or mottled. In addition, the leaves are often long and pointed and have spinney sides. Aloe flowers are tubular in appearance, and vary in color from yellow, orange or red. The flowers are usually densely clustered, simple or branched leafless stems. The most famous of Aloes is the Aloe Vera. It is revered for it medicinal herbal properties. 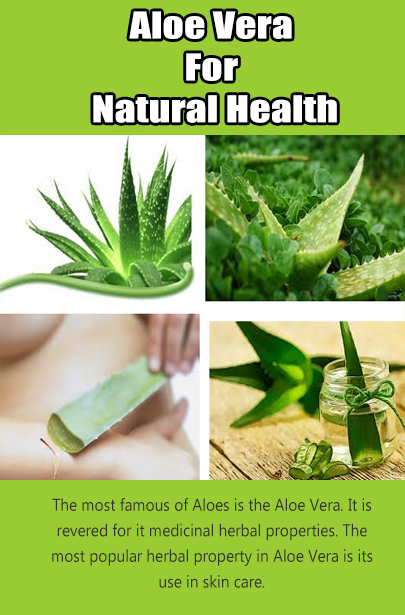 The most popular herbal property in Aloe Vera is its use in skin care. Aloe Vera has both antiseptic and antibiotic properties which makes it highly effective in treating skin irritations such as cuts, burns, eczema, and sunburns and will also relieve the itch from poison oak, poison ivy and poison sumac. Additionally, Aloe Vera is widely used in the cosmetic industry as moisturizing ingredient, improve elasticity in the skin, and reduce the sign of aging, just to name a few. Although the plant is 96% water, the remaining 4% contains active ingredients such as amino acids (provides 20 of the 22 human required amino acids & 7 of the 8 essential ones), minerals (Calcium, Chromium, Copper, Iron, Magnesium, Manganese, Potassium, Sodium, Zinc), Vitamins (A, C, E, B, B12, Folic Acid) and enzymes. The Vitamins A, C, E contains antioxidants, which are why they are so widely used in skin care. Very few people are allergic to Aloe Vera, which is why it is used so heavily in the cosmetic industry. However, as with any new product a patch test is recommended. To do a patch test, break off a small portion of the plant and apply a small amount to the inside of wrist, wait 24 hours to see if there is any indication of an allergic reaction. Aloe Vera is an easy plant to care for. Aloe Vera plants are easy to care for. They require plenty of sunshine, light watering and live long. All around they are a hardy plant and easy to care for. In many households, they are often grown on windowsills so that the wondrous properties of the plant are always available. Growing your own Aloe Vera is recommended. Store bought gels, although effective, will never compare to the effectiveness of a freshly cut leaf. This is due in fact to the time that has elapsed from harvest to the final product and display. If you decide on purchasing your Aloe Vera gel, read the label to ensure that it is 100% pure. Below is an easy homemade skin care recipe, which provides substantial benefits to the skin. Mix well in food processor. Apply to face in gentle circular motion. Rinse thoroughly with tepid water. Tags: aloe vera side effects on hair, aloe vera side effects in hindi, side effects of patanjali aloe vera juice, aloe vera juice side effects kidney, aloe vera side effects on liver, aloe vera juice side effects pregnancy, aloe latex, aloe vera gel benefits for skin.